I have a problem... I seem to have forgotten how to use a plate and fork. Yes, this time of year I find myself curling up with dinner in a bowl nearly every night. No, I'm not a senior citizen, but I do love soups and stews and it is DAMN cold outside. This is Chicago for God's sake... the high today was 10 degrees. It was the first day I could feel my contact lenses on my eye balls. Down coats (including for the tiny dog) and Uggs are in full force. So yeah, I like warm stuff in a bowl this time of year. 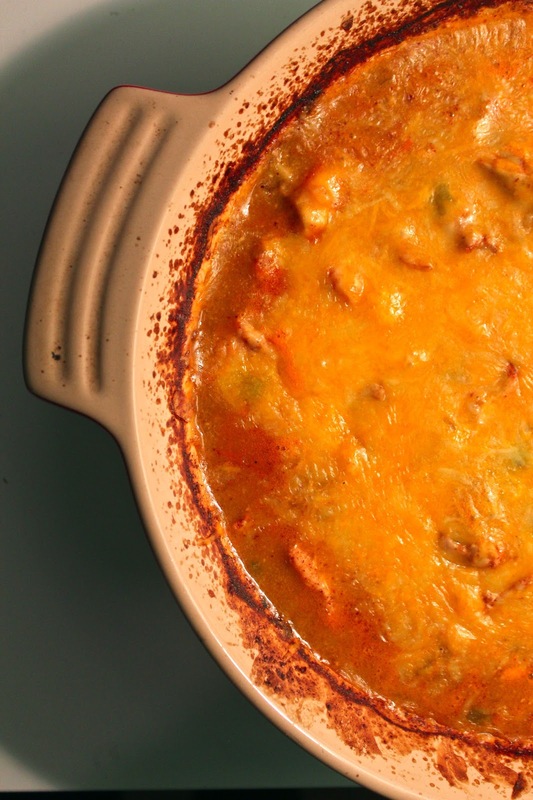 If there is a bright spot in this wintry tundra, its cozy family favorites. I already shared my Chicken and Dumpling Soup and I must have had my lovely Stepmother on the brain, because I recently made her famous White Chicken Chili too. It's a family classic for sure, but it was originally adapted from the Romertopf Clay Cooker Cookbook, specifically the tattered and torn version of it from the 1970s that lives in my parents' bottom cabinet. A classic. I don't actually have a clay cooker, but a heavy earthenware casserole does the job just fine. It's a simple prep, mostly combining and layering the ingredients before baking. It takes a bit to cook, but nearly all of the time is hands off. Use this time to browse vacation deals and plot your escape from the howling wind. 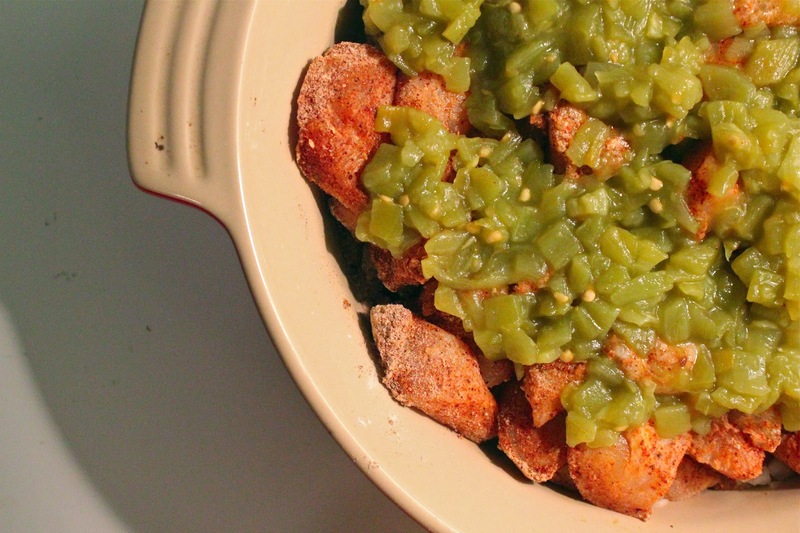 Those little cans of green chilis are a great pantry staple. I don't know about you guys, but this time of year my grocery store always runs out on Sunday afternoons, so I stock up when I can. Who's ready to dig in? Let it warm you from within and think about people you love who've shared recipes and meals with great affection. Oh and call your brothers to brag about eating their favorite meal. Suckers. Preheat oven to 400 degrees. 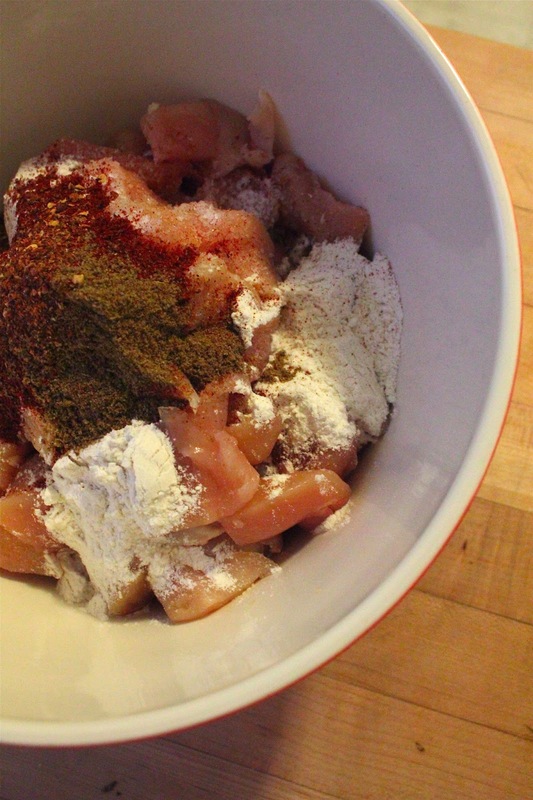 Toss chicken in flour, chili powder, salt, cumin and red pepper flake. 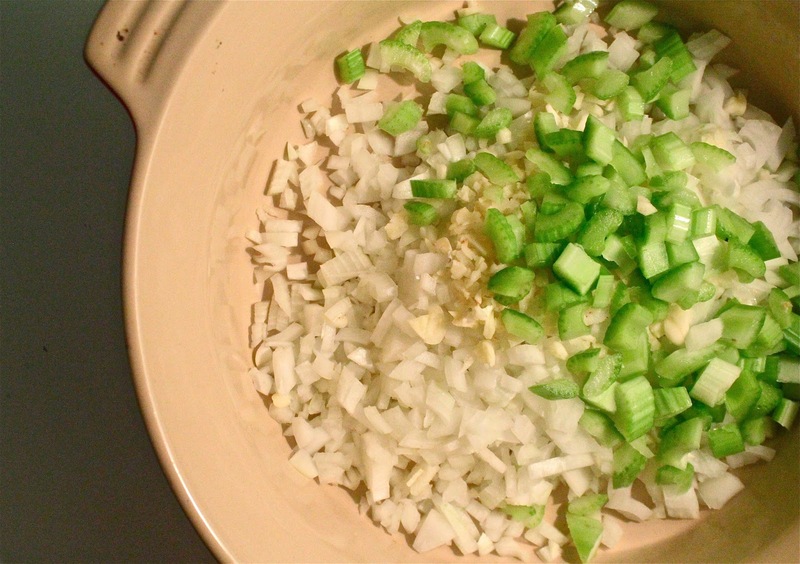 Place onion, celery and garlic in the bottom of an large casserole. Layer chicken on top of celery and onion mixture. Top with green chilis and pour chicken stock over the mixture. Cover and bake, stirring once or twice, until chicken is cooked through and lightly browned; about 1 hour. 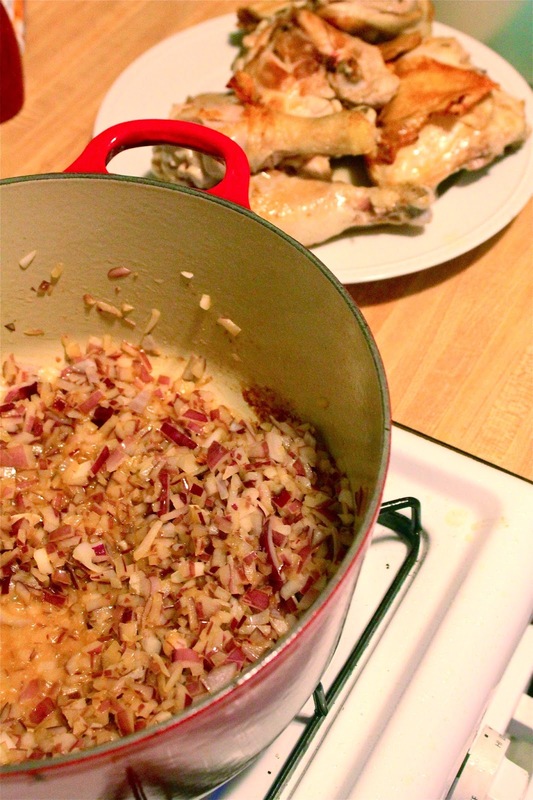 Remove from oven and skim any fat from the top of the chicken. Stir in sour cream and top with cheese. Bake for another 10 minutes, until cheese is melted. Serve over brown rice. Dish will be VERY hot when removed from the oven, so take care. You know when its coming... the scratch in the back of your throat, the subtle ache in your forehead that lurches further and further back and the feeling of complete exhaustion when you climb the three flights of stairs to your apartment. You have the flu. Its useless to blame your co-worker or the sneezing man on public transit, you're just sick. And as you may have heard, this year's a rough one. Luckily I've not been plagued yet this year (I pray this post isn't a bad omen), but the Husband was struck the week after Christmas. What to do for a poor sickling? 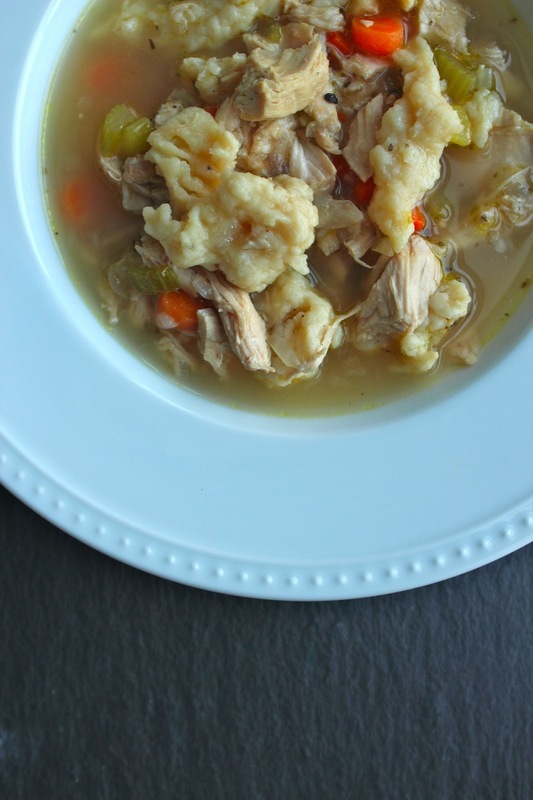 I'm no doctor, but my best recommendation for the flu is simple... chicken and dumpling soup. Sure the soup is comforting a mild enough to tolerate with an upset tummy, but there is scientific evidence that suggests it may actually help. For realsies. On the less scientific side, I think dumplings are yummier in soup that noodles. I mean, why would you want a boxed noodle when you could have a pillow-soft, dough-y bite? 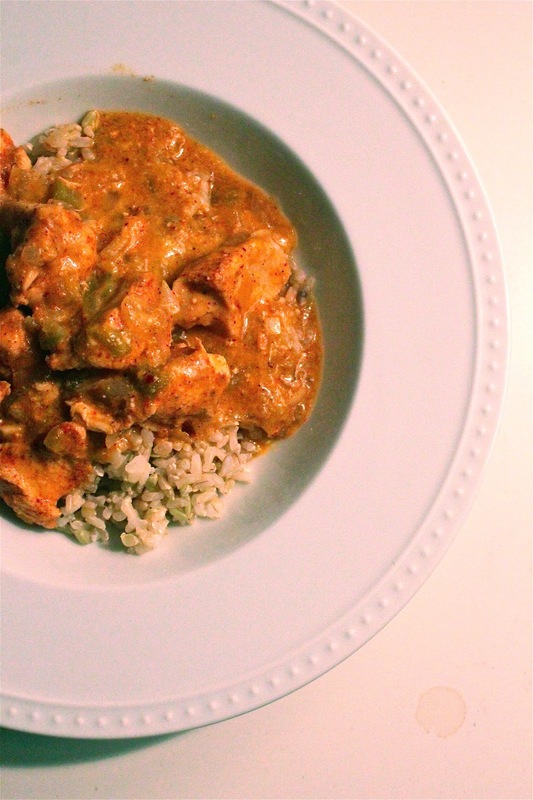 This recipe hails from my Stepmother and is always on hand if one of us is sick. Being that the Husband was a few hundred miles away from her, I took it upon myself to prepare it. In a large stock pot, combine chicken, carrots, celery and onion; cover with 10 cups water. Bring to a boil and simmer for 1 hour. 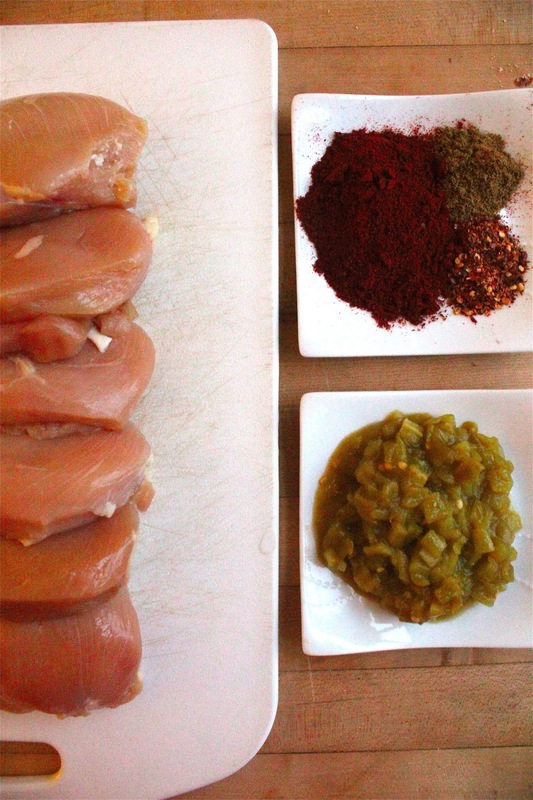 Remove chicken to a plate and allow to cool slightly before removing and discarding skin. Strain stock to remove carrots, onions and celery; discard. In a clean pot heat olive oil, then add finely chopped carrots, celery and onion. Cook until softened; about 15-20 minutes. Once chicken is cool enough to handle, roughly chop and pull chicken into bite-sized pieces. Add strained stock back to pot, along with chicken, Herbes de Provence, salt and pepper. Bring to a simmer and continue cooking for 10 minutes. In a separate bowl, combine flour, egg and milk. The mixture will be quite lumpy and gooey. Add dumplings by hand to simmering stock. Continue cooking until dumplings float; about 5 minutes. When it comes to throwing a dinner party, people seem to have some weird belief that you need to impress people with fancy schmancy new things. For me, I love when people make things that are close to their hearts -- be it a family recipe or a dish with a story behind it. As a host, it makes me feel special to share that with people I love and tell the story that goes with a dish. I think guests appreciate a genuine experience, especially a genuinely TASTY one. Not only did the menu draw on some of my favorite travel memories, but it was functional for a party. The dip was simple, the chicken took some time and the cake could be made ahead of time. Good to balance out some tougher, more time consuming challenges -- like tagine -- with an easy and quick dip like this. Turmeric, cumin and ginger are the real stars of this dip. 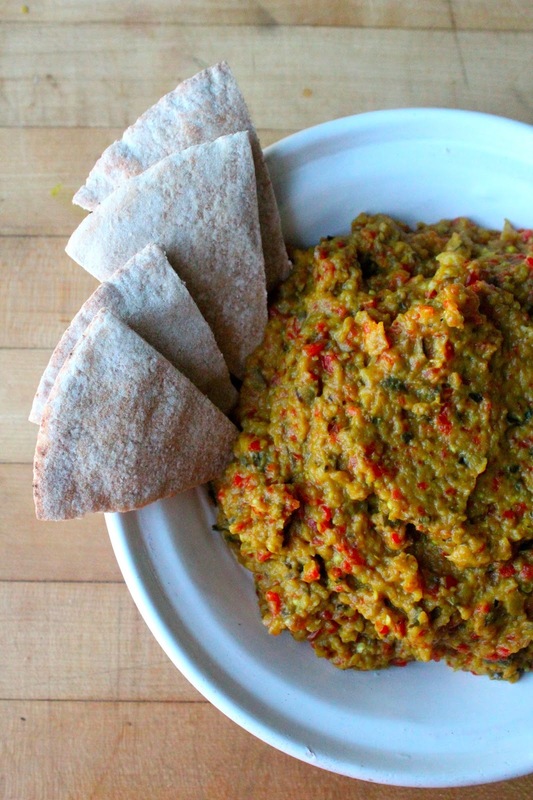 Sure, lots of places have eggplant dips, but these spices give an extra special flavor. One watch-out... the turmeric can leave yellow marks on porous surfaces -- like certain plastics or cutting boards. The smell and flavor are gone on my food processor blade, but can't figure out how to remove the color. Any one have a suggestion? I think I may soak in some bleachy water. I'll keep you guys posted. Heat olive oil in a large pan over medium-high heat. Add eggplant and saute for 5-7 minutes, or until completely softened. Add spices and red pepper; stir until fragrant, about 1-2 minutes. Add 3 tablespoons and cover immediately. Simmer for 4-5 minutes more. 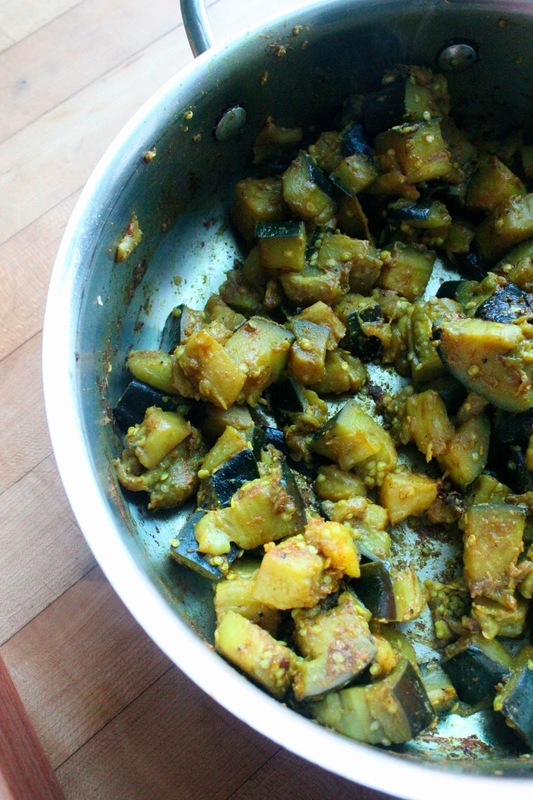 Allow eggplant to cool slightly and then spoon into food processor. Pulse until smooth and remove to a serving dish. 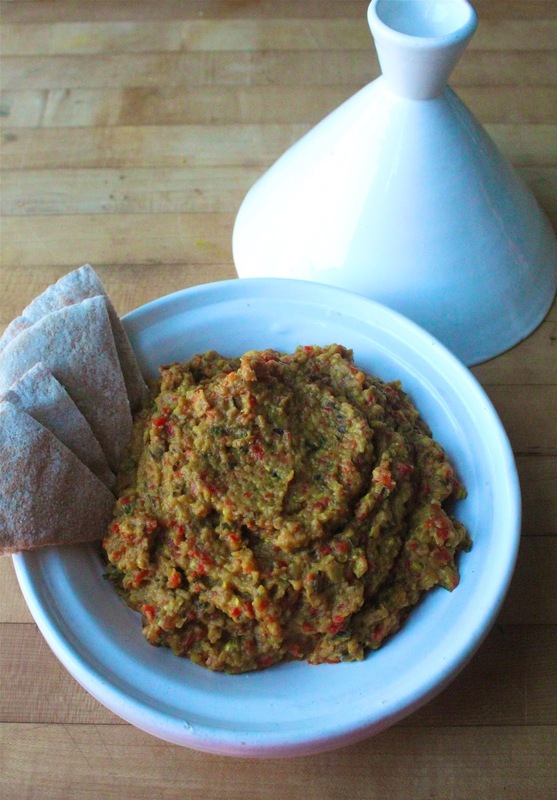 Serve with warm pitas. What is it about food that transports us? That sensory endeavor that takes you back to a favorite hole-in-the-wall restaurant a decade ago or even to another continent. 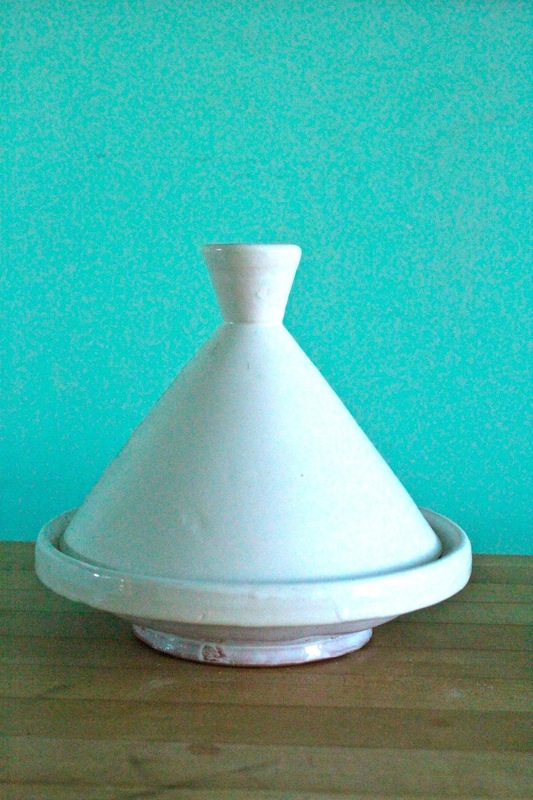 Years ago I visited Morocco and fell in love with a dish called tagine. This spicy, sweet braise has such a unique flavor that it instantaneously takes me from the wintry tundra of Chicago to the sands of the Sahara and the buzz of the medina. So what the hell is tagine? It actually refers to the funny shaped dish that is traditionally used to prepare it. It's conical shape moves steam in a way that keeps meat moist and fork-tender. I picked one up in Morocco and ingraciously hauled it back to the US, surely to the woe of every TSA agent and flight attendant. I hardly ever use it and I know I'm adamantly opposed to kitchen clutter, but this one just makes me smile. It's sculptural and filled with memories. I actually learned how to make tagine in a one-on-one cooking class at an inn in Marrakech. Raman showed me how and set off years of tagine cravings. It's a complicated and somewhat time consuming dish, but certainly worth the effort from time to time. Ironically, my tagine isn't actually big enough to use for a full dish. I know, right? But a heavy-bottomed dutch oven does the trick. In fact, America's Test Kitchen prefers using the dutch oven. You'll start by getting a solid browning on the chicken. Onions and loads of spice build an incredible base for the sauce. Dried apricots will beautifully set off the spices in the dish, building complexity and uniqueness. After a long simmer, serve over couscous and garnish with almonds and parsley. This culinary adventure will leave hardly a bit to spare. Dream of Saharan sunsets and spice markets while you do the dishes. Thank your tastebuds for the ride. In a large dutch oven heat olive oil over high heat until shimmering. Pat chicken with paper towels to dry and season with salt and pepper. Add chicken, start skin side down and brown both sides (about 4-5 minutes per side). Take care not to crowd the chicken and brown in two batches, if needed. Remove chicken to a plate. Reduce heat to medium and add onion to remaining oil and cook until translucent, stirring frequently. Add garlic to pan, cooking 1-2 more minutes. Add turmeric, ginger, saffron and black pepper; stirring until fragrant. Add chicken stock, taking care to scrape all of the bits from the bottom of the pan. Add apricots and parsley (reserving 1 tablespoon) to pan and place chicken back in pan, along with any juices collected on the plate. Cover and reduce heat to very low. 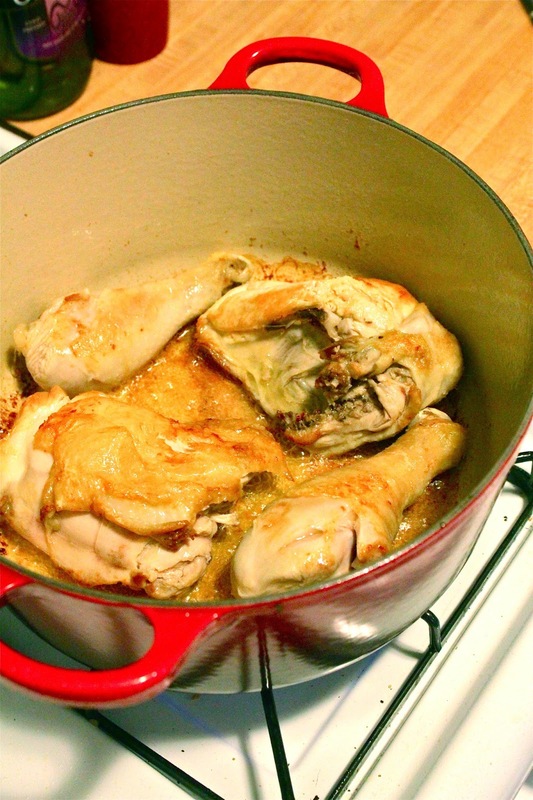 Simmer chicken for 45 minutes, or until internal temperature of chicken reaches 165 degrees. Boil water for couscous in a separate pot. Once boiling, add olive oil and couscous. Cover and remove from heat. After 5 minute remove cover and fluff couscous with a fork. Serve chicken and it's sauce over couscous. Garnish with almonds and parsley. While I'm not always a big sweets gal, I LOVE desserts that combine sweet and savory. I'm not sure what this says about my personality. Perhaps I'm duplicitous, or maybe just have a knack for mismatching. Red lipstick and Converse sneakers... yeah you know me. 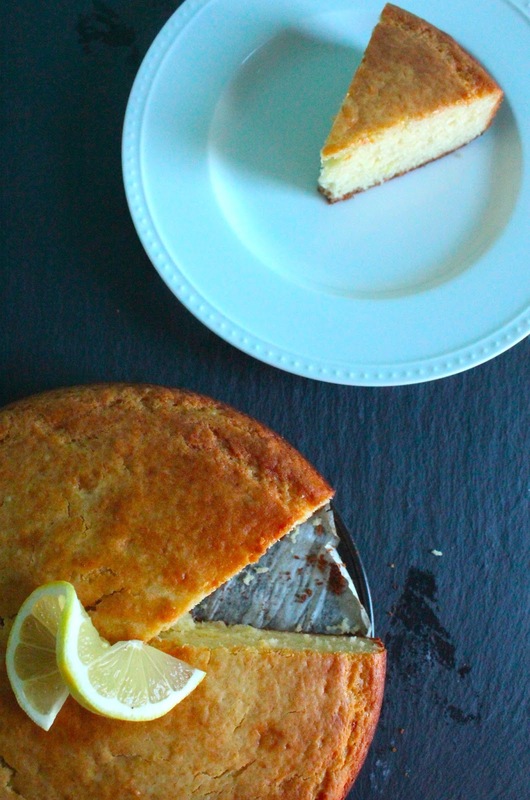 For a recent dinner party I was looking for a dessert with tang to offset the heavy spiced flavors of dinner and an olive oil cake was the perfect savory sweet balance. The olive oil keeps things from getting too saccharin and an Herbes de Provence glaze is unexpected and oh-so savory. I started with a basic yogurt cake recipe from TheKitchn. Easy enough for a non-baker like myself. For full-bodied texture and extra tang, I used Greek yogurt. In all honesty, I rarely bring home the traditional stuff anymore. A parchment lining for the spring form pan will make serving much easier. It's as simple as using the bottom of the pan as a template, cut out and flip over in the bottom of the pan. Just be sure you put the pencil side down... no one wants pencil cake. 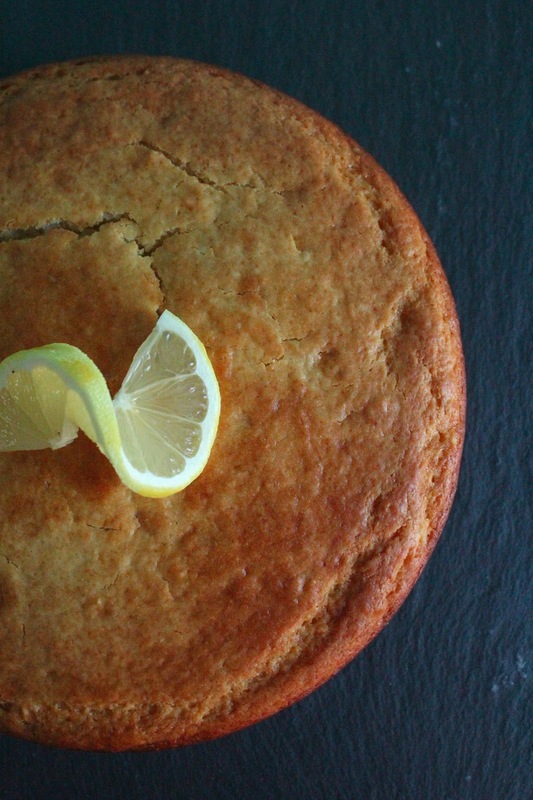 Seriously, this cake is really easy. No complex instructions, just two rounds of combining and stirring by hand. No mixer needed. Once you've removed the cake from the oven, you can start the glaze. 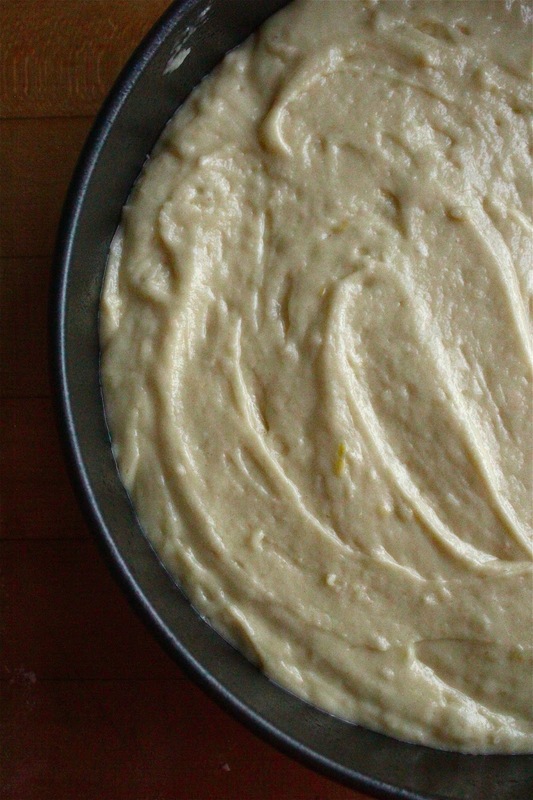 It only takes a few minutes, so it will time perfectly while you let the cake cool at bit. The glaze isn't anything fancy, in fact, it's just a variation on a simple syrup like the one you use to make drinks (check out my Basil Vodka Lemonade). I find terms like "sauce" or "glaze" or "reduction" can be really intimidating in the kitchen, but if you can learn a few basics, it's not too hard to make variations. Simple syrup is one of these, start by altering the flavors and then you can even mix it up with honey instead of sugar, like I did here. 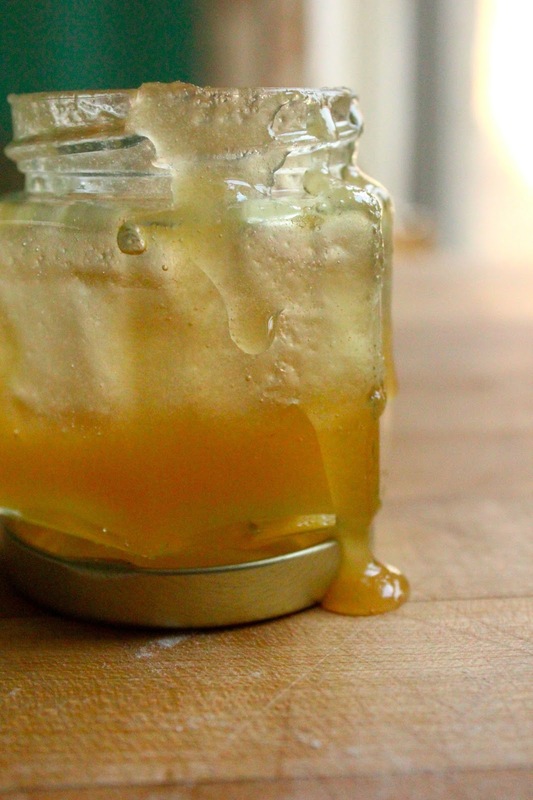 Side note: How cute is this little jar of honey? My friend did them as a favor at her garden wedding. I used an empty tea bag as my flavor infuser... and really dried herbs are too far off from tea, right? Before you know it you'll be ready to eat. I just serve up with the glaze spooned over the top of your slice. Preheat oven to 350. Use cooking spray to coat a 9-10 inch springform pan and use the pan to trace a template on parchment. Cut around circle and place marking side down in the greased pan. 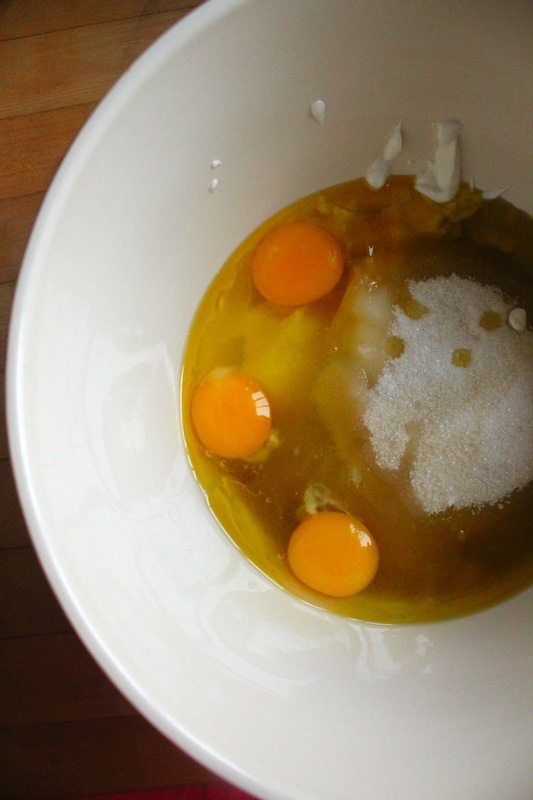 In a large bowl combine the yogurt, olive oil, eggs, sugar and vanilla. Add flour, baking powder, baking soda, salt and lemon zest; stirring just until lumps disappear. Pour into pan and spread evenly. Bake for 50 to 60 minutes or until a toothpick inserted in the middle comes out clean. If the cake begins to get too golden in the oven, cover loosely with foil. Once removed from the oven, allow to cool on a rack for 10 minutes before removing from springform pan. In a saucepan, combine honey lemon juice and water over low heat. 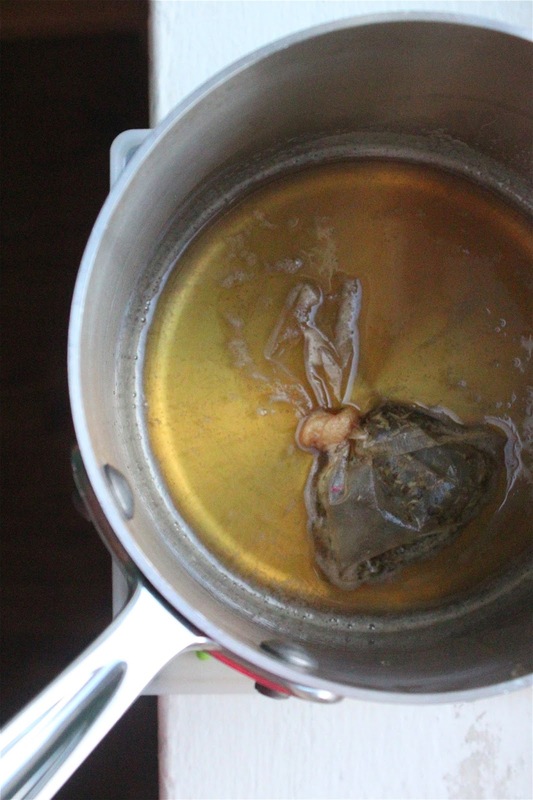 Spoon Herbes de Provence into an empty tea bag and place in sauce. Allow sauce to simmer for 15 minutes and then remove tea bag before serving. 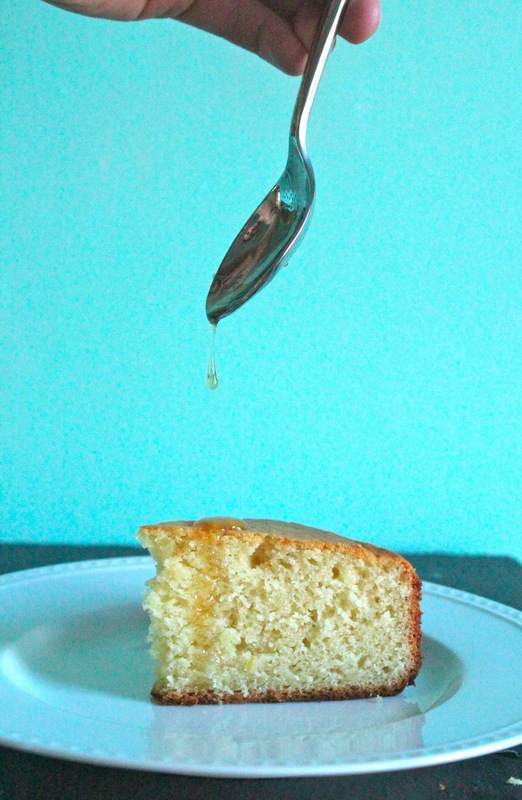 Serve cake warm with glaze spooned over the top. Perhaps you partook in a black tie New Year's Eve filled with Gatsby-esque glamour, elbow-length silk gloves and flowing fountains of sparkling Champagne. I can see the dripping diamonds now. But back to reality, the rest of us usually aren't usually so glamorous. This year we enjoyed a house party with friends and notably a lot of young male guests. So what did I bring? First rule of marketing... know your audience. Upon seeing the guest list, I knew Chicken Salad Skewers or Earl Grey Panna Cotta probably wouldn't go over so well. So what to make for a group of rowdy 20-something dudes? Chicken wings...natch! Buffalo chicken wings though, soooo junior year of college. We've matured alright... we've discovered new forms of hot sauce splendor. 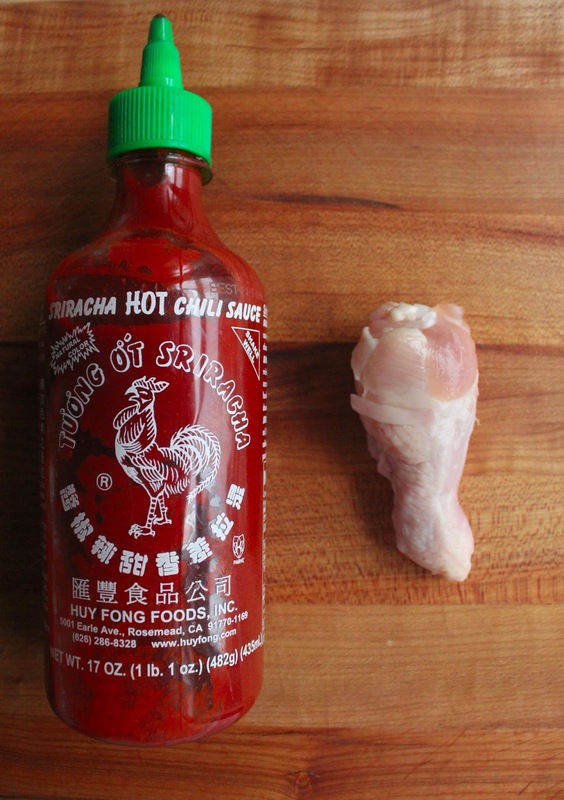 Sriracha was the perfect way to ring in 2013. So I know a lot of restaurants now offer "boneless chicken wings," but those are NOT chicken wings. They're chicken fingers with buffalo sauce. Some grocery store brands even go so far as to call them "wingz." There's a reason they can't call it what it is... walk away. Reject incorrectly spelled foods. Man up alright, pull the meet from the bone in a bold act of mastication!! There is a bit of break-down required when you buy raw chicken wings. 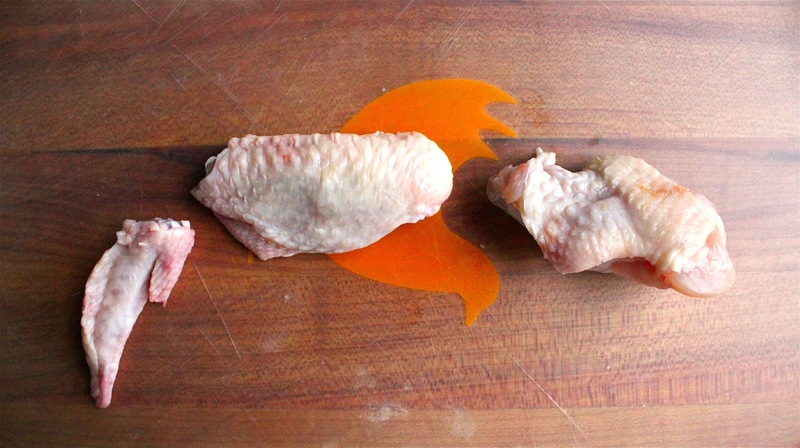 A sharp knife will help you easily dissect the two wing pieces and tip. Just cut along the joint and you'll be done in no time. Sriracha, soy, sesame oil, honey, ginger, garlic and lime give this killer Asian flavor. That said, it's still familiar enough to be wing-y and acceptable to the discerning palette of a Bro. 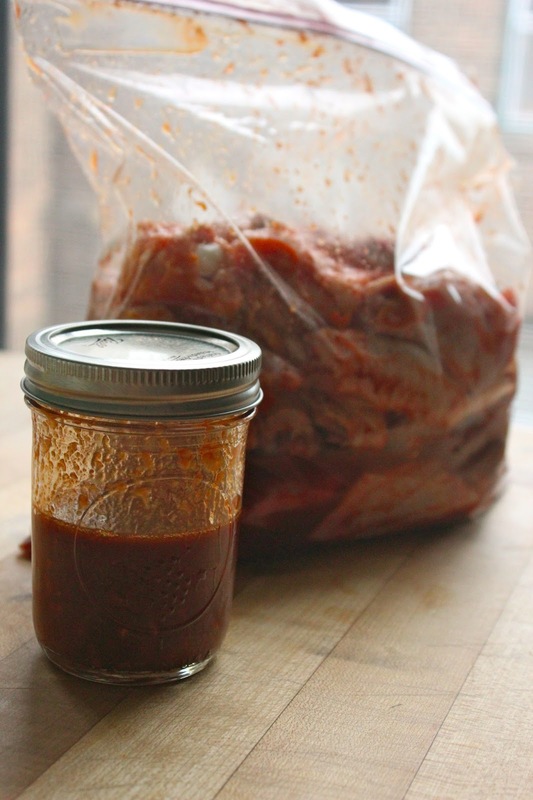 You'll just prepare one sauce mixture, using the most for a marinade and reserving a bit to sauce the wings. Ummm... you might also get a little tipsy on gin and Champagne at a party and forget to get more than one photo angle on your prepared wings, not to mention fail to notice a party popper wrapper on the plate. It was 2:00 am by this time, okay? Whoopsypoodle... hope you guys will still love me. If not purchased prepared, break down chicken wings by separating the two sections and wing tip, using a sharp knife to slice at the joint. Discard the wing tips. 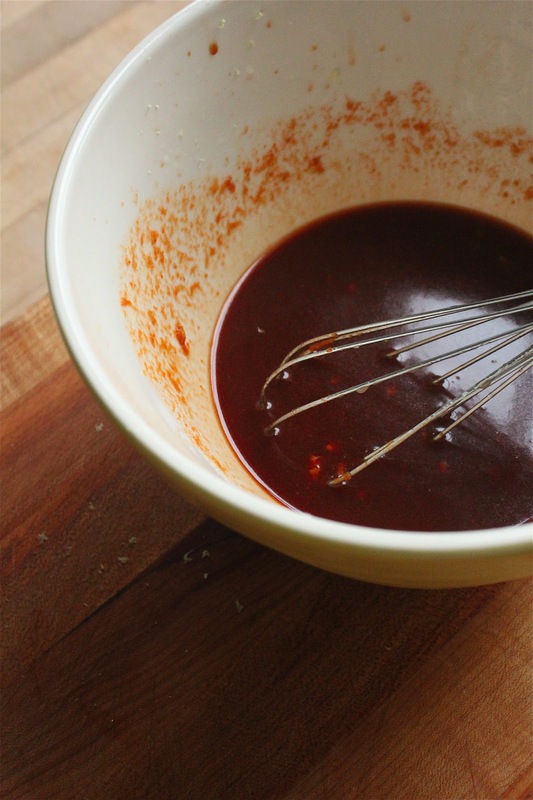 In a large bowl, combine ginger, garlic, lime juice, soy sauce, sesame oil, sriracha and honey. Reserve 1/2 cup of sauce. Pour remaining sauce over chicken wings in a large freezer bag, ensuring wings are completely coated. Refrigerate overnight (or at least 4 hours). Preheat oven to 400 degrees. 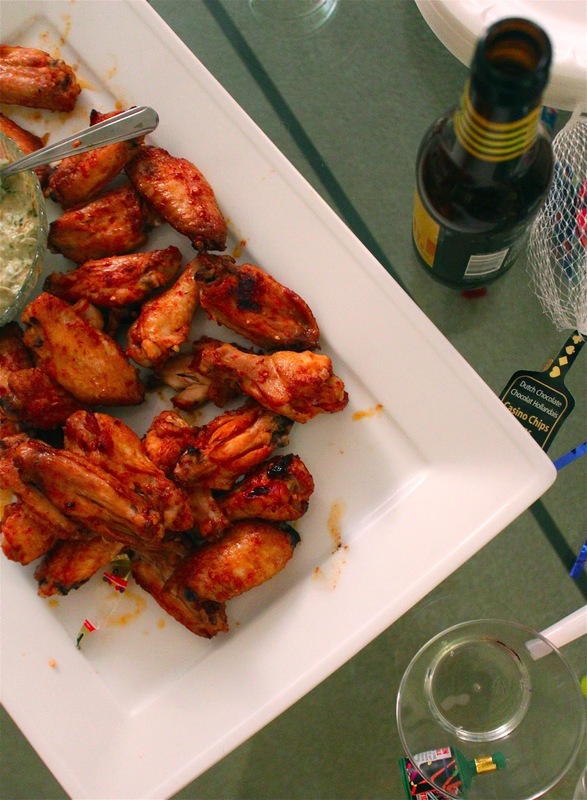 Place chicken wings on a foil-lined cookie sheet, in a single layer. Bake in oven for 30 minutes. Remove wings from oven and rotate on sheet and brush on remaining sauce. Cook for another 15-20 minutes, or until sauce thickens on wings. Serve hot. I suggest avocado crema as a dipping sauce. It's good luck. Didn't you know that? Or is it just Southern people? Whatever your regional creed, we could all use some good luck in the coming year. I'll take the good luck, but I'm not one for New Year's resolutions. That said, I would like to commit to floss more this year. Does that make me a slacker? Whatever, at least I'll be a slacker with good gums. I don't know, resolutions just seem cliche and too easily broken to me. If you're serious about a commitment to yourself, you'll do it at any time. You're a strong woman like that. Whether you're resolving or not, eating yummy stuff for good luck seems do-able. 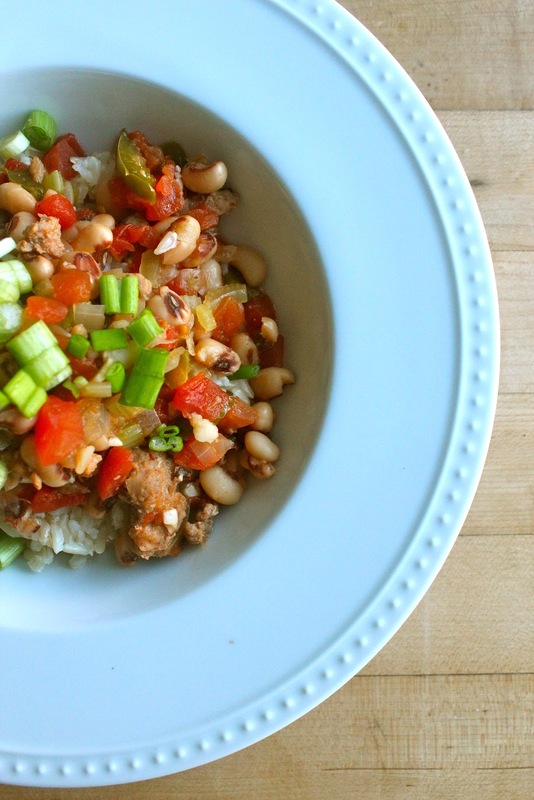 These delicious black eyed peas will get your new year started right and are warm and cozy enough for even the coldest of Northern nights (it was 6 degrees when I woke up this morning... not cool). 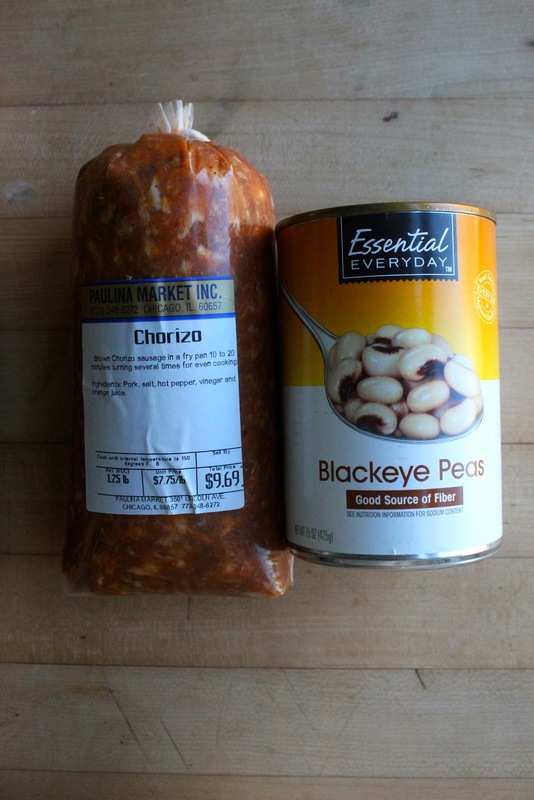 While not always available, this time of year I can always find canned black eyed peas. Stock up while you can, because these suckers are good. I'm pairing with some AWESOME chorizo sausage that I picked up at one of my favorite places in Chicago, Paulina Meat Market. Northsiders get it... meat heaven. The cajun holy trinity gets things started... celery, green pepper and onion. Some simmering and you're ready for a cozy meal on the couch. Warmed through and full of good luck (and hopefully well-flossed teeth). Heat olive oil in large dutch oven over medium heat; add chorizo breaking up and cooking until browned. 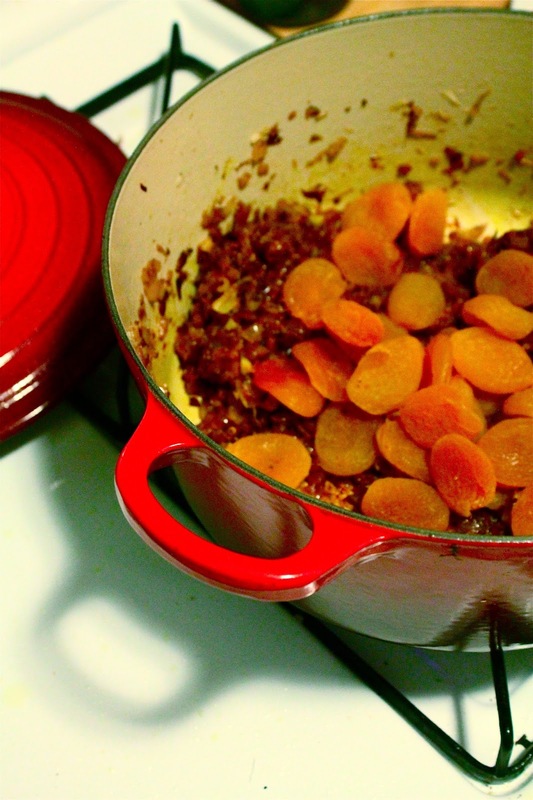 Using a slotted spoon, remove chorizo to a plate and leaving rendered fat in bottom of pan. 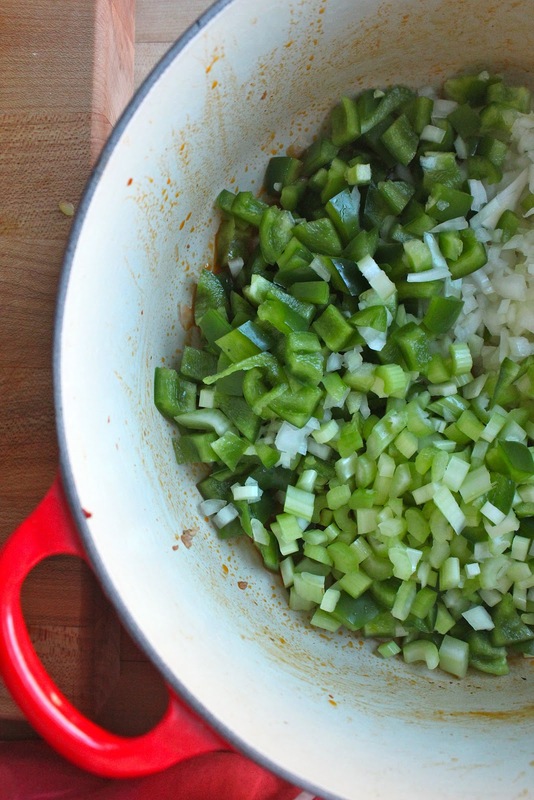 Add onions, green pepper and celery. Stir often and cook until vegetable soften, about 10 minutes. Add garlic cook for one minute until fragrant. Add black eyed peas, tomatoes, chicken stock, salt and cayenne. Bring to a boil and reduce heat to simmer. In a separate pot, boil water for rice. Add rice and simmer, covered. Stir once or twice and cook until rice absorbs all water; about 45 minutes (depending on your rice). Beans can simmer the whole time the rice cooks, and should do so for at least 45 minutes. Serve peas over rice and top with chopped green onions.